WTF happened to free speech? Florida State Senator Joe Gruters (R) has introduced a bill to protect free speech on social media and fine the biggest sites a minimum of $75,000 in statutory damages if they delete or censor a user’s religious or political speech. 36 people were arrested on the Greek island of Lesbos for erecting a giant metallic cross meant to deter illegal Jihadists from reaching their Christian island. When defending your own culture is a crime, then you are being ruled by criminals! Shame on our gutless government. Radical Islamic headbanger gets visa to spew his vomit in Australia, Tommy Robinson has visa denied. What a bunch of a$$holes have we rule over us??!! Milo Yiannopoulos says the Liberal Party are “not fit to govern” if they cannot protect free speech, as he faces the possibility of being denied a visa to Australia. The far right celebrity told The Australian he was “confused, appalled, amused and devastated” to receive a Department of Home Affairs letter telling him he could be denied a visa over an unpaid $50,000 security bill to Victoria Police and extremist riots outside his controversial 2017 Australian shows. 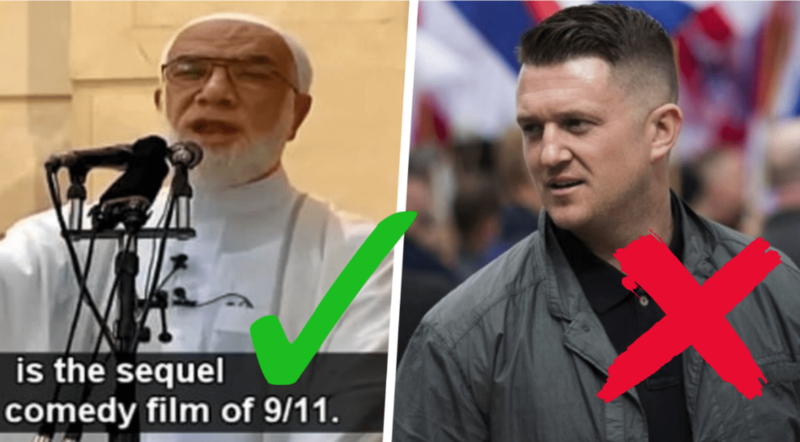 He pointed towards the recent Australian tour by Eygptian Islamic preacher Sheik Omar Abdel Kafi – who called 9/11 a “comedy film” – and said he was being denied the same right to free speech. “The idea that any western country would welcome a hate preacher like Omar Abdelkafy while banning a champion of free speech, capitalism and Christianity is unconscionable, but it’s especially awful coming from Australia, until recently a fair-minded land of common sense,” he said. Mr Yiannopoulos’s call against the Liberals could complicate Scott Morrison’s attempt to bring back votes from right splinter groups like One Nation. Mr Yiannopoulos said the riots outside his Melbourne show in December 2017, which led to five police officers being injured was caused by the “feral left” and that deplores political violence. Home Affairs officials have told Milo Yiannopoulos he could be denied a visa partly due a $50,000 bill to Victoria Police. The Notice of Intention to Consider Refusal letter, which has been obtained by The Australian, states he may not pass the character test for entry into Australia due to the arrests made at his 2017 Australian shows, his statements about minorities, and Victorian Police Minister Lisa Neville saying he and his promoters had not yet paid security costs. But the pressure on Immigration Minister David Coleman to allow Mr Yiannopoulos continues to mount and his tour promoter, Penthouse Australia’s Damien Costas, told The Australian he never received a bill from Victoria Police. “The Department of Home Affairs (the Department) holds information about which suggests you may not pass the character test … in the event the person were allowed to enter or to remain in Australia, there is a risk that the person would: incite discord in the Australian community or in a segment of that community,” the Home Affairs letter reads. “There were significant protests at Mr YIANNOPOULOS’ events in Sydney and Melbourne in December 2017, despite the location of Mr YIANNOPOULOS’ speaking engagements being withheld by event organisers until 24 hours prior to the events. “Hundreds of protestors rallied outside the events. The protest at Mr YIANNOPOULOS’ Melbourne event involved violence and five police officers were reported as having been injured. The protest at Mr YIANNOPOULOS’ Sydney event also culminated in seven arrests. “Victoria Police issued Mr YIANNOPOULOS with a bill of $50,000 for the cost of policing his event in Melbourne. Mr YIANNOPOULOS was reported in July 2018 to have not paid the Victoria Police bill. “Mr YIANNOPOULOS was reported as saying ‘I love it when protestors turn up to my shows … when people are yelling in the streets, it gets me off’. Mr YIANNOPOULOS states he is a ‘troll’ and that ‘one of the purposes of trolling is to generate as much noise and public outcry as possible’. Mr Yiannopoulos took to Facebook last night to share articles on his difficulties entering Australia, and quoted his supporter Pauline Hanson. Mr Yiannopoulos’ spokesman in Australia, Luke Izaak, said this was the third time Mr Yiannopoulos had received notification from Australian authorities that he intended to deny his visa, including before his 2017 tour which included a trip to Parliament House. Mr Costas said he has never received a bill from Victoria Police and that Mr Yiannopoulos intends to fight any attempts to stop him coming to Australia. “I’ve never received a bill from Victoria Police. And if I had, I would challenged the veracity of that bill. It was political grandstanding,” he told The Australian. “Milo hasn’t said anything that hasn’t been said by politicians in The Australian Senate. Victoria Police would not confirm that Mr Costas was ever sent a bill or that any of the $50,000 security costs had been recouped. “Victoria Police does not disclose the cost of engaging our services, or the private discussions held as part of the arrangements,” a Victoria Police spokeswoman said. “While we will not be commenting on any events in particular, public safety is a joint responsibility between the police and event organiser. Previous PostNotre Dame Prof: Our Schools Are Committing ‘Civilizational Suicide’Next PostMelbournistan: “Good Boy” Meets Virgins!